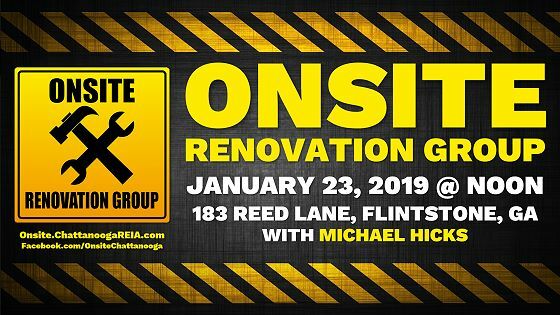 The Onsite Renovation Group (ORG), led by Michael Hicks, is an educational and networking group for both new and seasoned investors that focuses on the acquisition, renovation and retail resale (fix and flip) or rental (buy and hold) of single and multi family residential homes. The Onsite Group meets on the 4th Wednesday of each month at NOON ET at an active renovation site, build site or rental property which will vary from month to month and be announced prior to the meeting on the Chattanooga REIA Calendar. 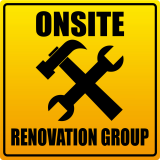 The Onsite Renovation Group will focus on properties in and around the Chattanooga metro area. The purpose of this group is to allow both new and experienced rehabbers and investors to meet, network and share knowledge and experience with "hands on" access to real property. As always, there is no charge for Chattanooga REIA members to attend. Not-Yet-Members and guests can currently attend at no charge, but will pay a door fee in the near future. Now displaying 1 - 4.